Fresh Brussels spouted sauteed with bacon and garlic. My original recipe for this, which I made with pancetta, was featured in Taste of Home’s 2010 Holiday’s & Celebrations annual cookbook. But since I’m 100 times more likely to have bacon on-hand than pancetta, I cooked it with bacon this time. There’s a lot of wiggle room with this recipe. If you like your Brussels sprouts cooked firmer or softer, simply adjust your cooking time. If you don’t have chicken broth, water will work just fine. If you'd rather use pancetta, rock it out. I've even added golden raisins and nuts a time or two… just jazz it up however you like! Add bacon to a large skillet and cook over medium-high heat until bacon is slightly crisp. Add garlic and Brussels sprouts then sauté for 5 minutes. Add broth to skillet and stir to deglaze the pan. Add salt and pepper to taste. Reduce heat to medium and continue to cook, stirring occasionally, for 8-10 minutes or until Brussels sprouts are tender. Yummy, one of my favorite vegetables! Oh my goodness! I love this recipe. I have a bag of brussel sprouts in the freezer and have been thinking about fixing them all week. Guess I need to thaw the bacon too. How wonderful you had this recipe published with such a 'famous' company. Congrats on that too. Thanks for linking up at Weekend Potluck. 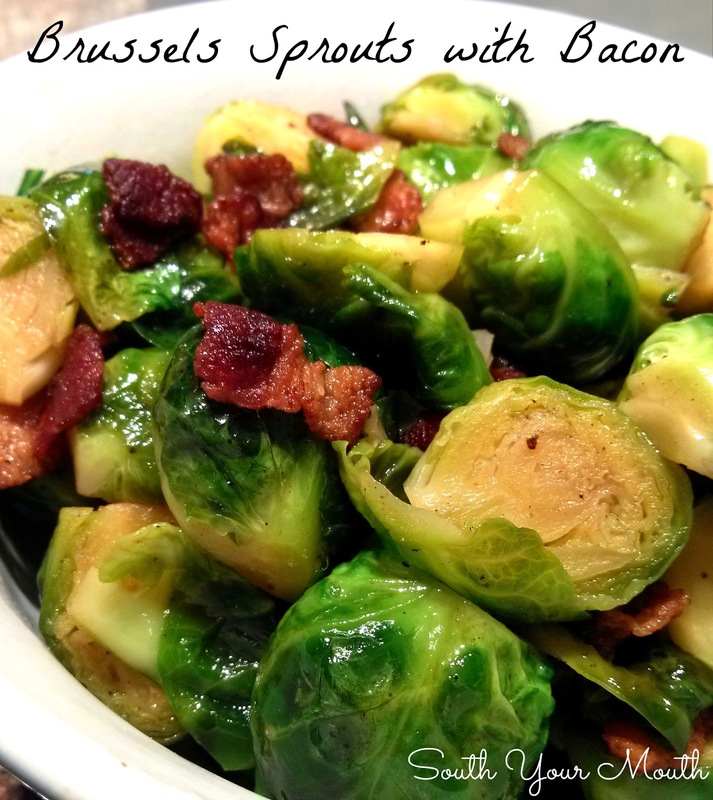 My husband loves brussels sprouts.. & bacon, have to give this a try this year for Thanksgiving! Just saw this on Pinterest! I can't wait to try this. I love Brussel sprouts and bacon. and your baked Pimento Cheese Dip looks amazing. Do you use fresh or frozen brussel sprouts? Do you at any point drain the bacon grease? Nope :) There's not really much there for a whole pound of sprouts. My new favorite way to cook Brussels sprouts! Served them with Oven Barbequed Chicken. The hubby loved them.